I STAY AWAY from politics on this blog, for the most part. It just gets you into trouble with unreasonable people. I never argue with people who know they are wrong. But here's my take on Tuesday's debacle of a primary election. In Adams County, many places ran out of ballots because the county clerk did not anticipate the large number of voters. Now we have two state's attorney candidates in limbo until Thursday. We have a lot of people who couldn't vote because there were not enough ballots. There are all kinds of stories out there about ballots being stuffed into drawers to be counted by hand later, etc. Geesh. If I'm on the losing end of this election, I'm gonna wonder, too. Then we had to hear about the guy who didn't vote because his day got busy. Apparently it didn't stop him from opining on the subject. Man, just be quiet. You. Didn't. Vote. 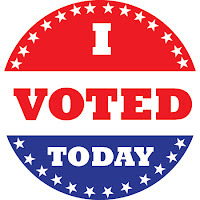 I don't care why you didn't vote, unless it was because you didn't have a ballot. Did you know there is early voting the month before the election? As for the argument we need touchscreen ballots, well, of course we do, Simon Simpleton. But even though you just had a really busy day, remember this - the county clerk didn't make enough ballots because he was trying to save money. I'm sure he can find a big chunk of change somewhere to have touchscreen ballots for the next election. After all, it's not like the state of Illinois is broke or he has to watch every penny in his office budget. Sheryl and I voted early, and I'm glad we did. Yesterday was hectic in here, with a full slate of guitar lessons, visits from several company reps and a huge shipment of Dean and Takamine guitars arriving at Second String Music. There's was no way we were going to get away. So we planned ahead, something old Simon should have done. Early voting is easy. You go to the courthouse. You vote. You are done.